Usually after the parade, a sumptuous Barbadian meal is the order of the day. Several of the island’s restaurants unveil their independence menus, catering delicious Independence Day breakfasts and lunches in a truly Bajan way. Indulge in fried plantain, fish cakes, cou cou and flying fish (or salted cod), macaroni pie, Bajan soup complete with Bajan dumplings, sweet bread, great cake and the seasonal conkies. And, don’t forget to visit the local roadside vendors to savour a sno-cone, tamarind balls, and nutcake or sugarcake - all local sweets! For the rest of the big day, take a scenic island outing to see and mingle with the many happy and proud Barbadians found ‘liming’ - our version of hanging out - along the island’s shores, national parks and popular picnic spots. 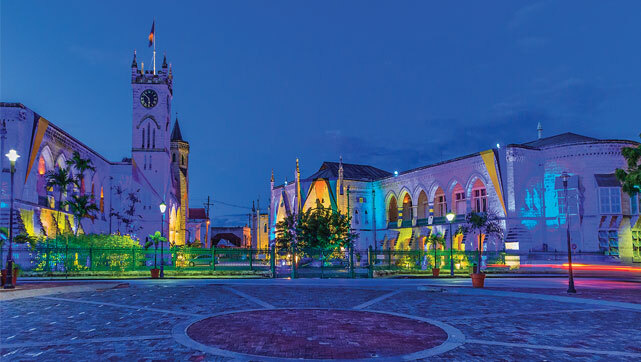 While out on your excursion, be sure to check out the many local art galleries such as Drift Gallery and Deebles Point Art Gallery and Artisan Market, or even participate in a special Independence Day hike with Hike Barbados or a walking tour of Speightstown and its museum! And while you’re at it, don’t forget to wear your blue, yellow and/or black! And finally, for the lovers of local music and fans of the party scene, November is now being considered the ‘New Crop Over,’ thanks to several promoters unveiling independence themed parties at lovely plantation homes and other venues; party cruises along the island’s gorgeous coast; and carnival-inspired parades complete with music, paint and powder under the shimmering night’s sky. Of course, it is all topped off by the island’s favourite spirit in all its many forms - rum!